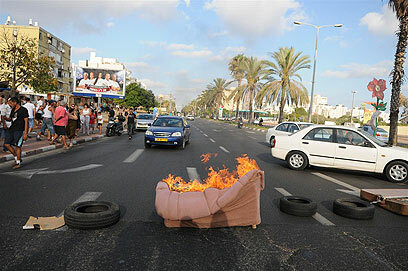 Some 100 residents from Holon's "Jesse Cohen" neighborhood blocked one of the city's main roads on Wednesday, setting fire to furniture and tires and calling out: "The people demand public housing" and "We won't move until we get aid." Police and fire-fighting units were called to the scene; but no arrests have been reported. 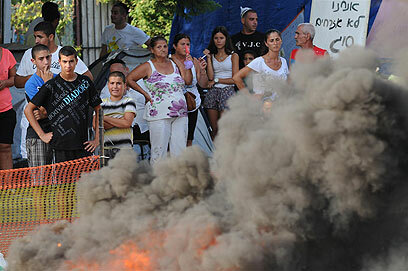 Neighborhood committee Chairman Nissan Zacharia said the residents have aggravated their protest after the Holon Municipality had ordered them to disassemble six wooden sheds that were built near the neighborhood's "tent city," as part of the nationwide housing protest movement. "The situation has become unbearable, and now they also want to kick residents out of wooden shacks," Zacharia said. "This should serve as a first warning sign to the government. What is happening in Britain can also spread to Israel. These are residents from underprivileged classes, for whom apartments are not a luxury. These residents will not give up their struggle, and will continue to fight for their homes," he added. The residents, who have been living in some 30 tents for the past two weeks, built six large wooden sheds which they planned to turn into a "permanent outpost." The "tent city" is home not only to young residents protesting the high cost of living, but also senior citizens who have been long in the waiting for public housing. The residents, who receive funds from the State's social services, claim they are intentionally being ignored by authorities. "Why did the transportation minister visit the tent city in Rothschild Boulevard, and not us? The true hardships are here, not there," one of the residents lamented. Meanwhile, leaders of the housing protest continued to take pride in the non-violent nature of their movement, but raised concerns that "something else" will divert attention from their struggle. "There's an attempt to draw the attention away from the protest by creating external threats and instilling fear of an existential threat," Stav Shaffir, one of the protest leaders, told Ynet. Shaffir commented on the uprisings taking place in the Arab world and in Britain, saying: "Clearly the world has seen a momentum this year, with people going out on the streets and demanding change. "We are conducting a non-violent protest, which is an amazing example of how a social struggle can amass such great power without using weapons," she said. Residents of Tel Aviv, Jerusalem, Beersheba, Haifa and Kiryat Shmona held simultaneous demonstrations Wednesday night as part of the socioeconomic protest movement sweeping across the country. In Tel Aviv, dozens of Democratic Workers Organization activists marched from Tel Aviv's Levinsky Park to Rothschild Boulevard, in protest of contract workers' employment conditions. Meanwhile, in Beersheba, activists took the protest a step further, stripping down to their bathing suits. Some 100 residents of Jerusalem, including representatives of the haredi sector, marched from the Bikur Holim hospital to the city's tent site in protest of the deterioration of the city's public transport system. 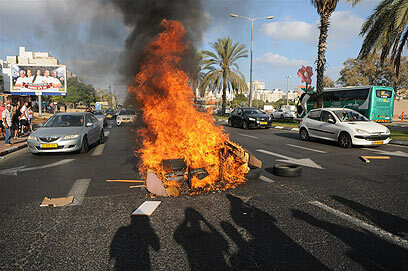 See all talkbacks "Holon residents torch furniture, tires"